The standard NEC DSX-40 configuration provides 4 CO/line ports, 8 digital station ports, 2 analog station ports, and 2 analog doorbox ports with relay controls. 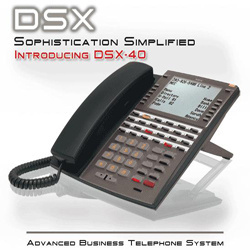 The NEC DSX phone system is easy to install and expands easily to 8 lines with 24 business phones. Built-in 2-port automated attendant, with multiple line greetings, and customizable dial action tables. Built-in caller ID information that can be logged at each extension and that can be sent to analog phones with caller ID capabilities. Over a decade of rigorous feature development ensures that the core NEC DSX call processing features are mature, efficient and reliable — yet intuitive and easy to use. Combined with end-to-end quality assurance and state-of-the-art circuit design, the DSX will be your reliable business partner for years to come.